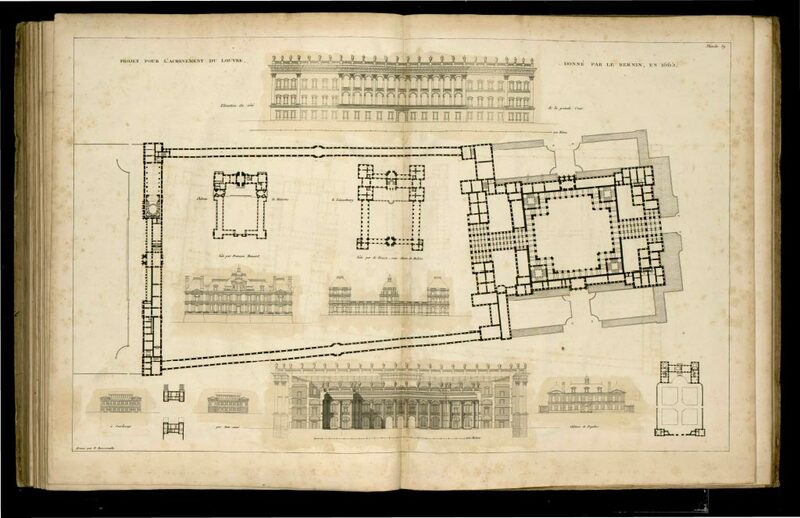 Jean-Nicolas-Louis Durand‘s “Recueil et parallèle” is a musée imaginaire of world architecture. 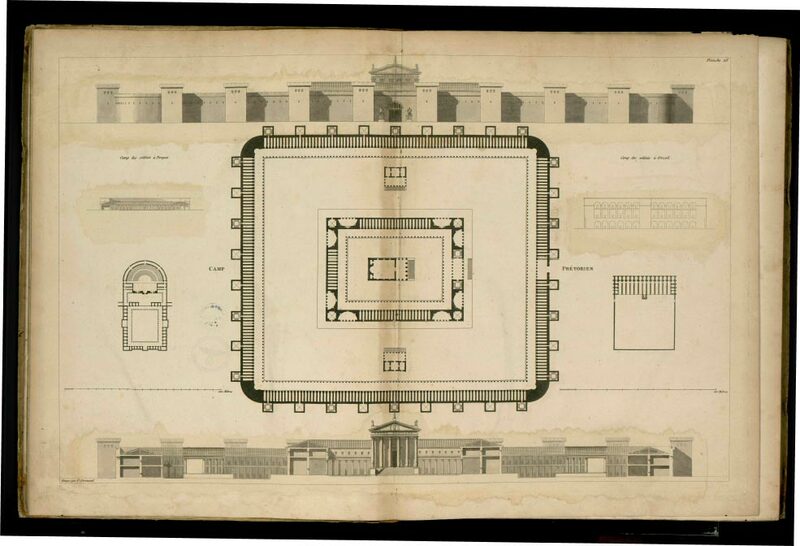 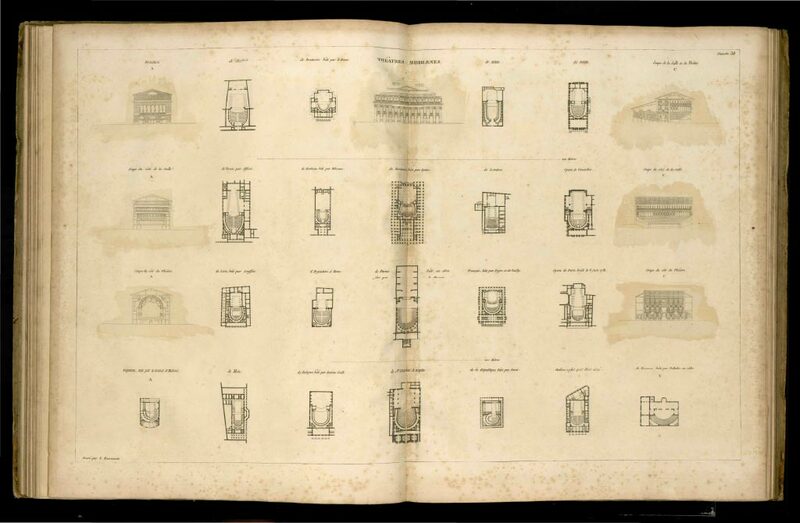 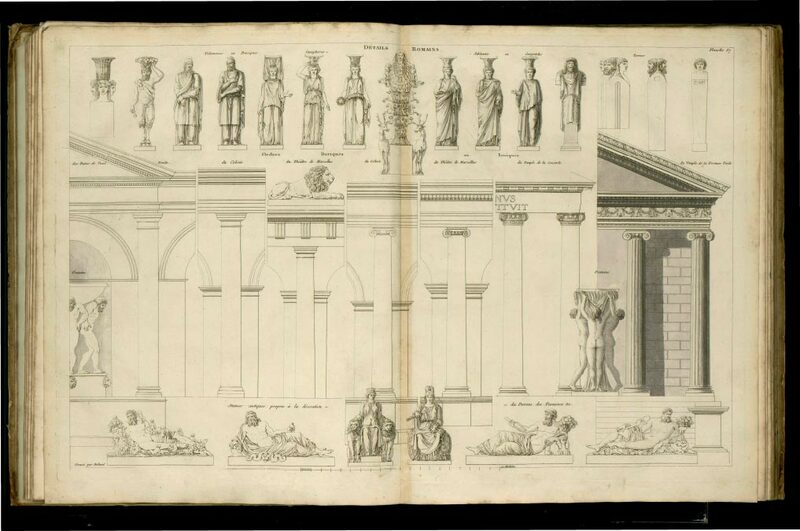 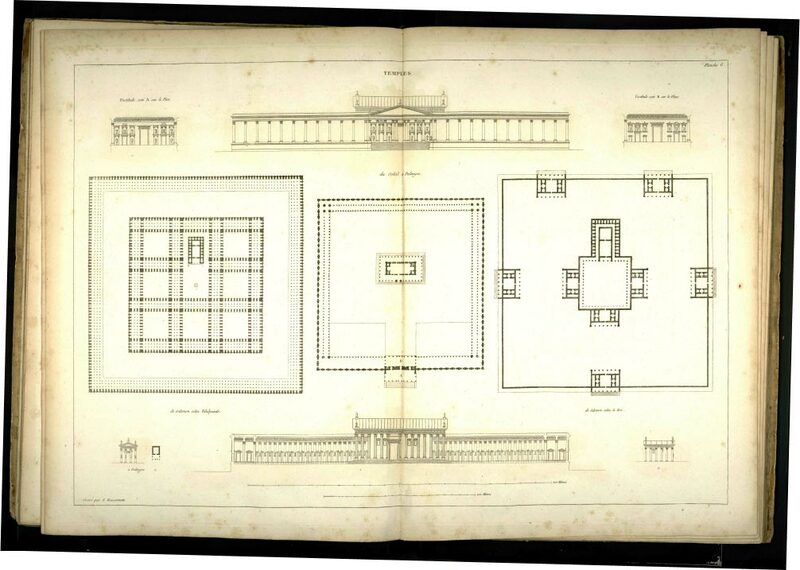 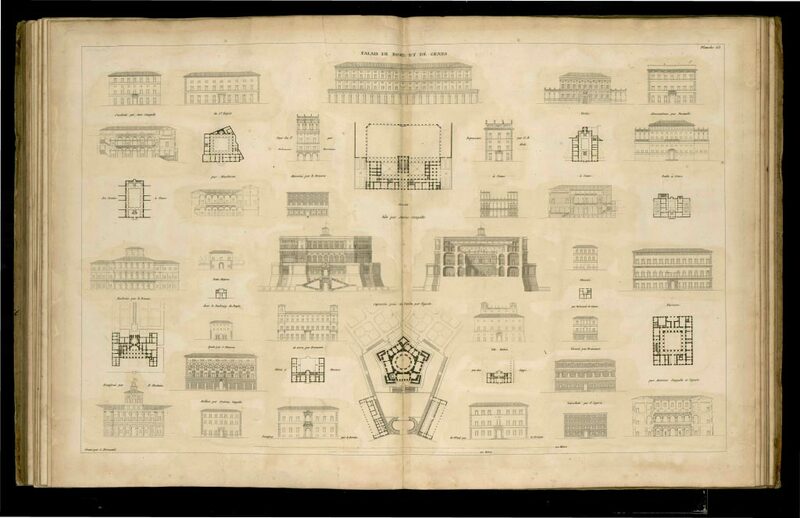 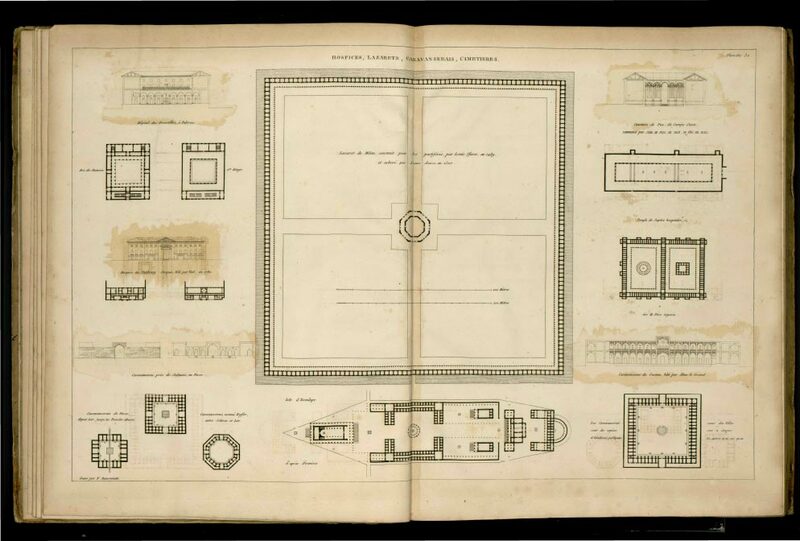 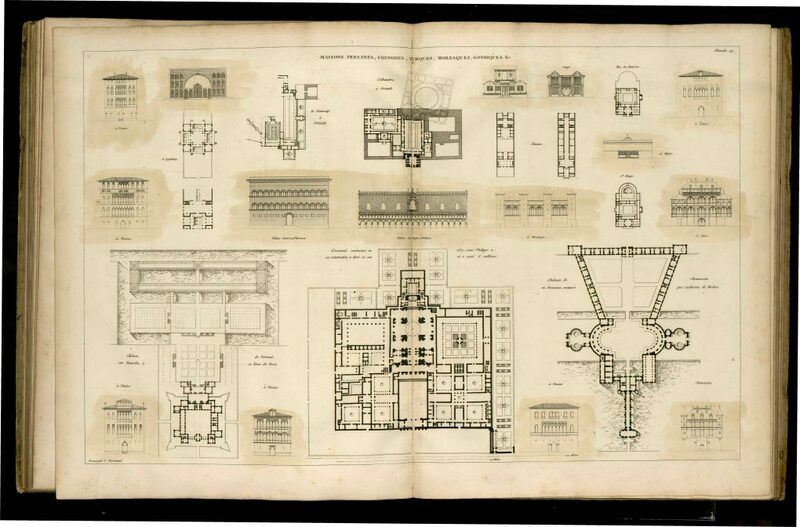 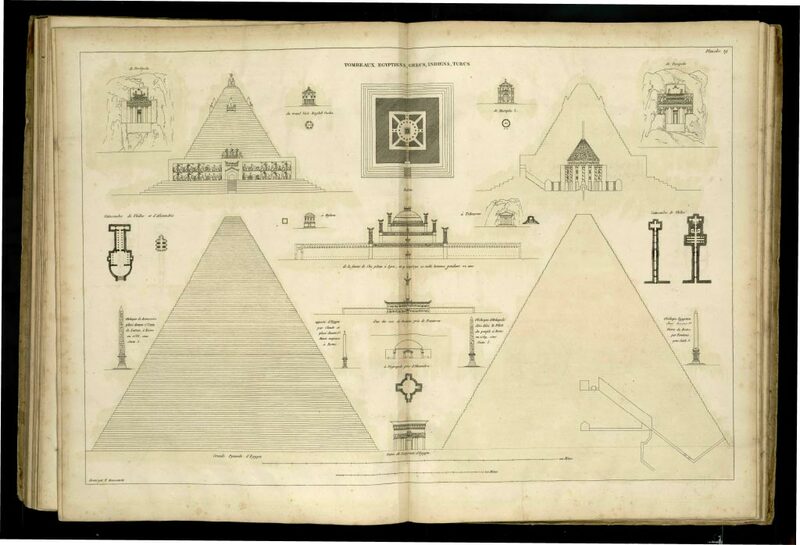 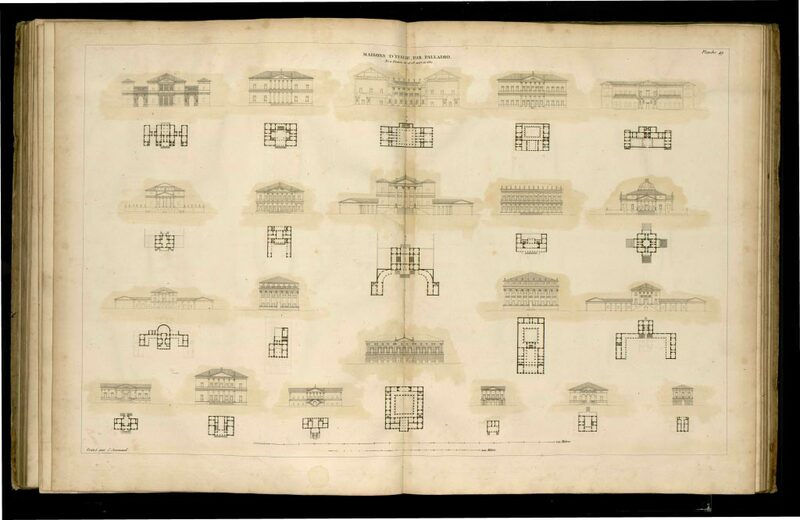 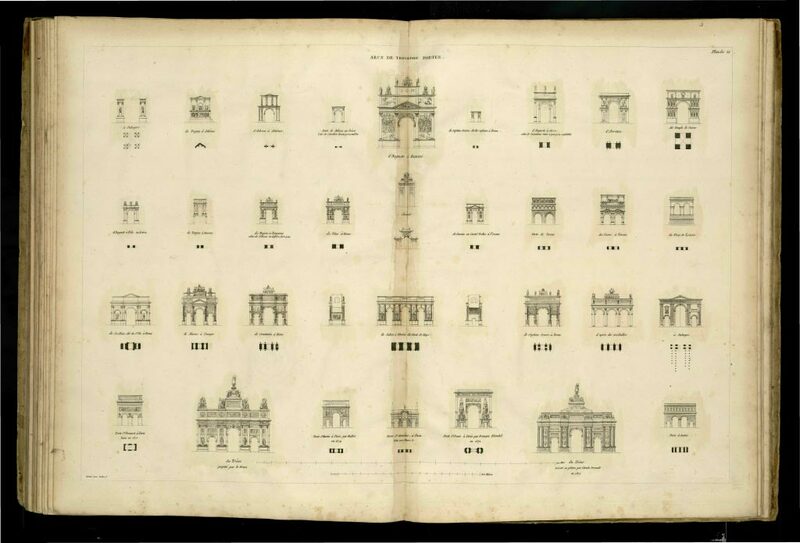 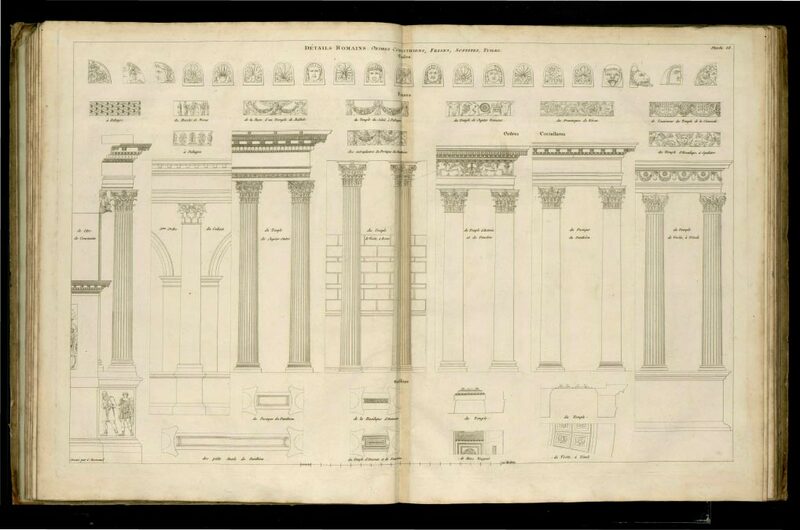 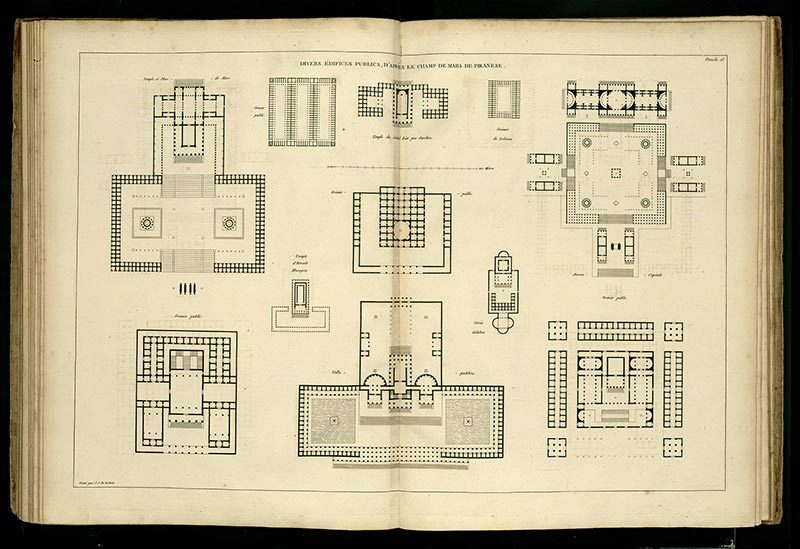 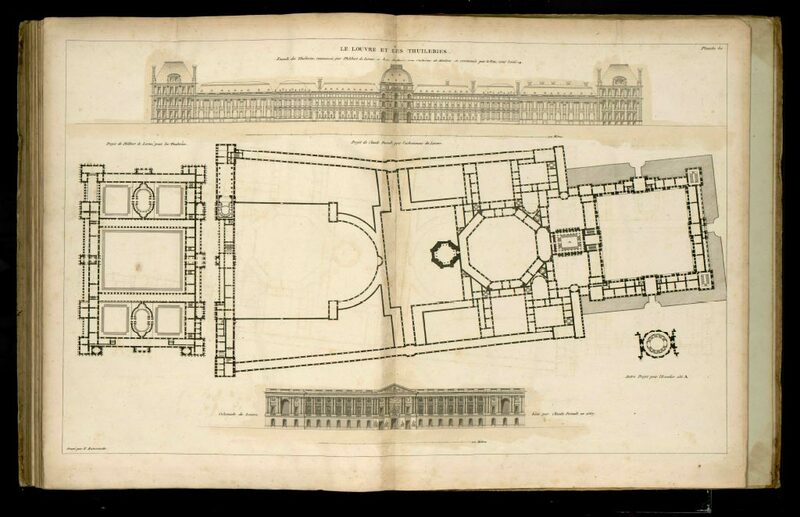 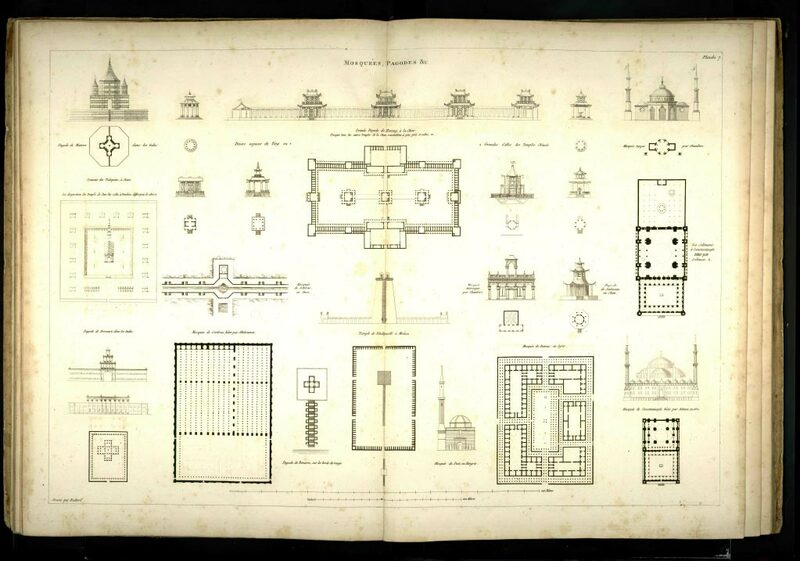 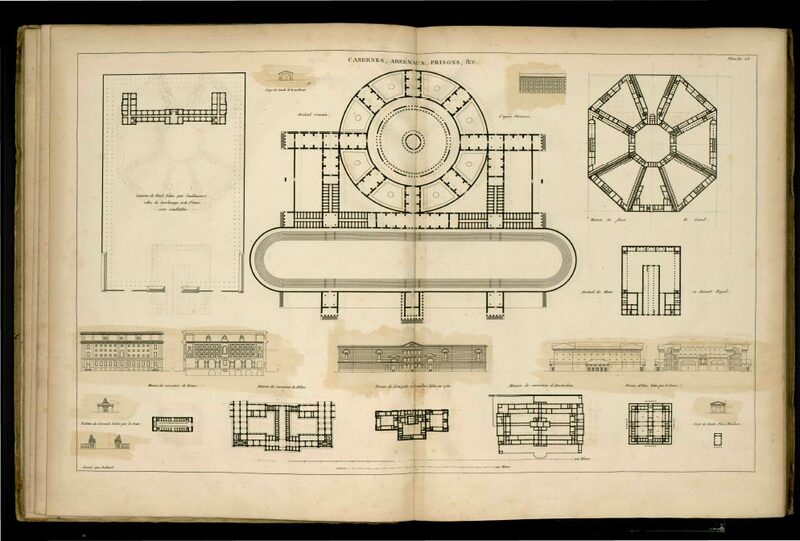 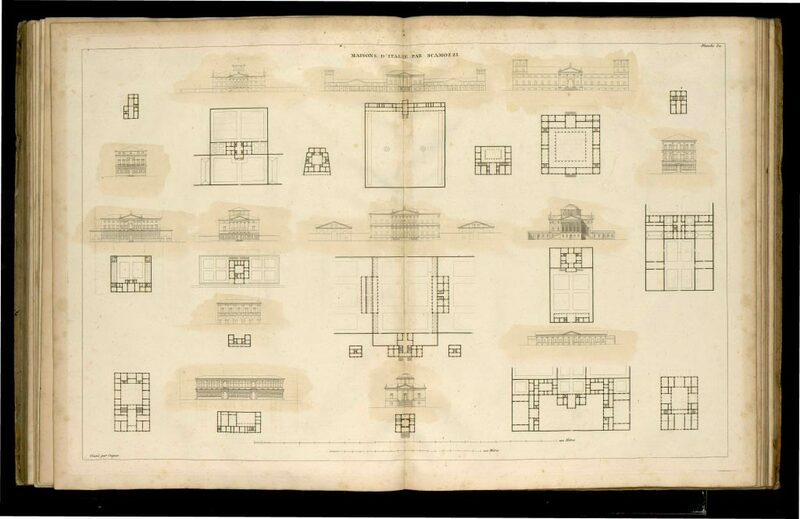 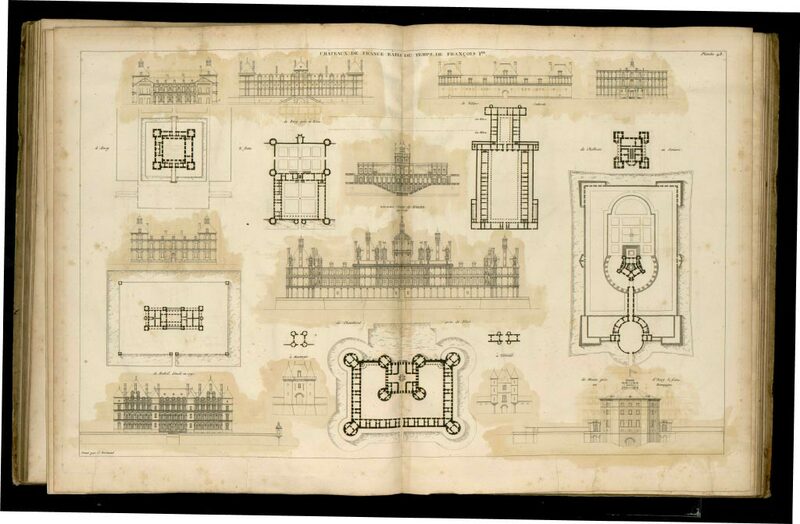 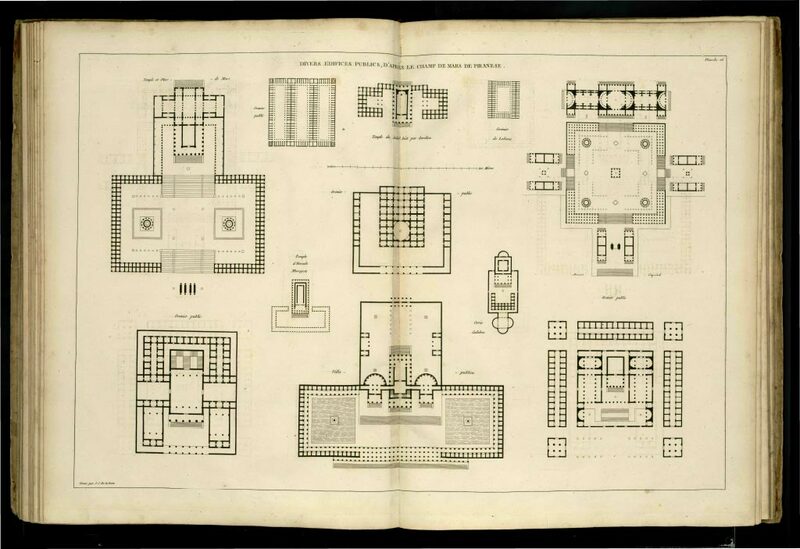 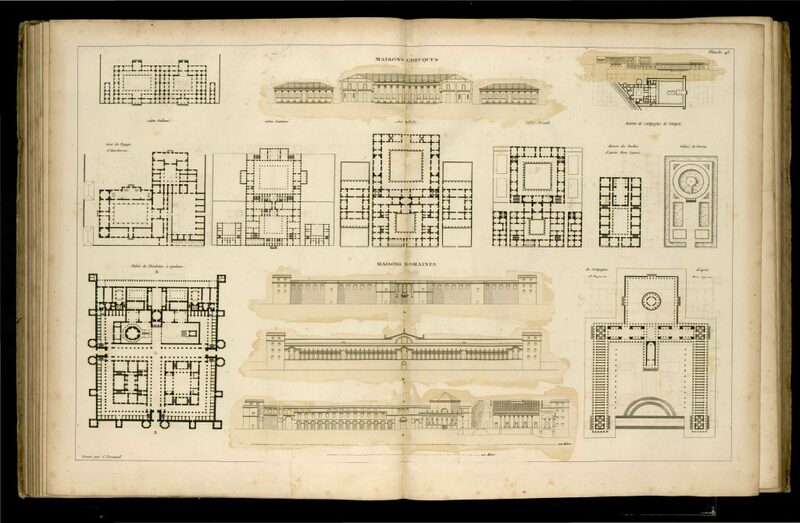 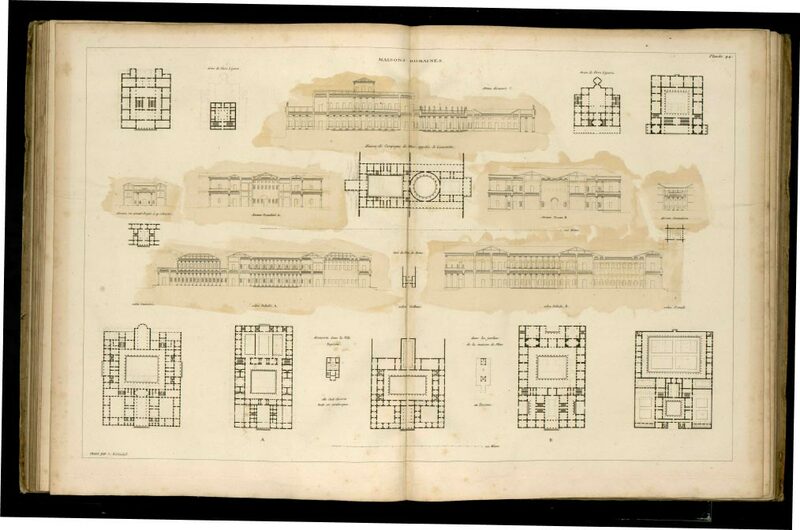 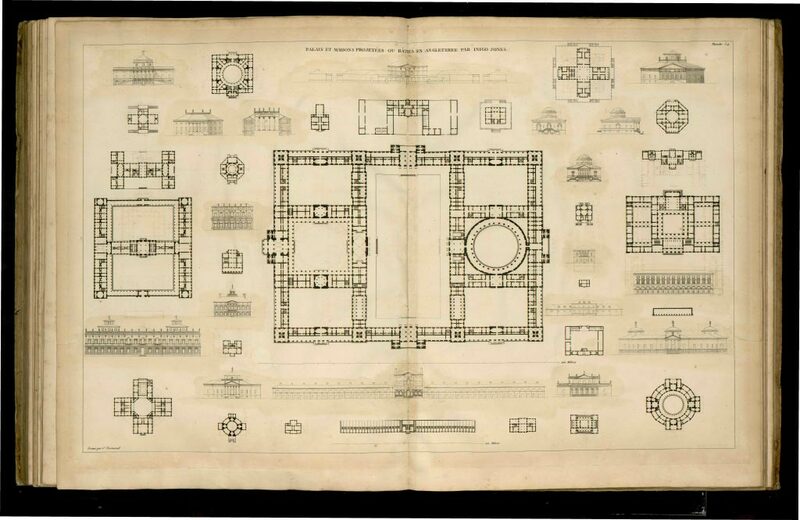 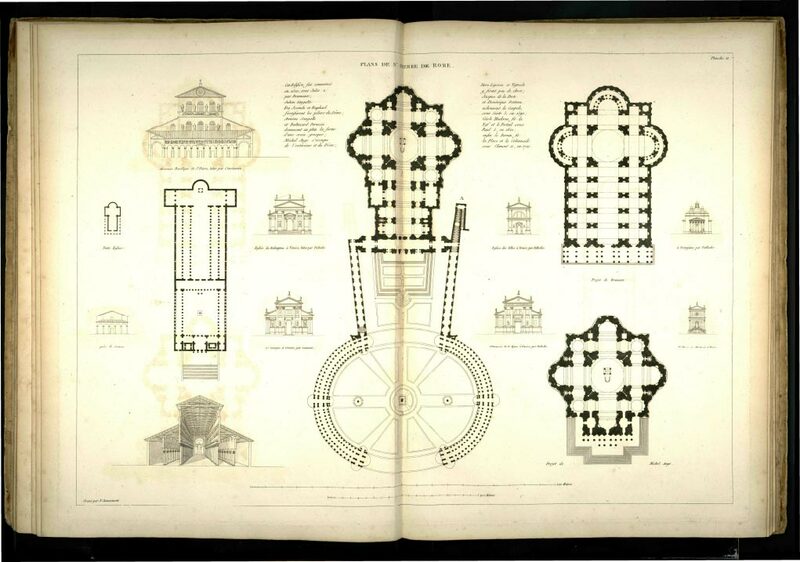 A large folio of 63 plates measuring 51×66 centimeters, the book regroups in each plate specific buildings, of uniform scales, pertaining to certain types. 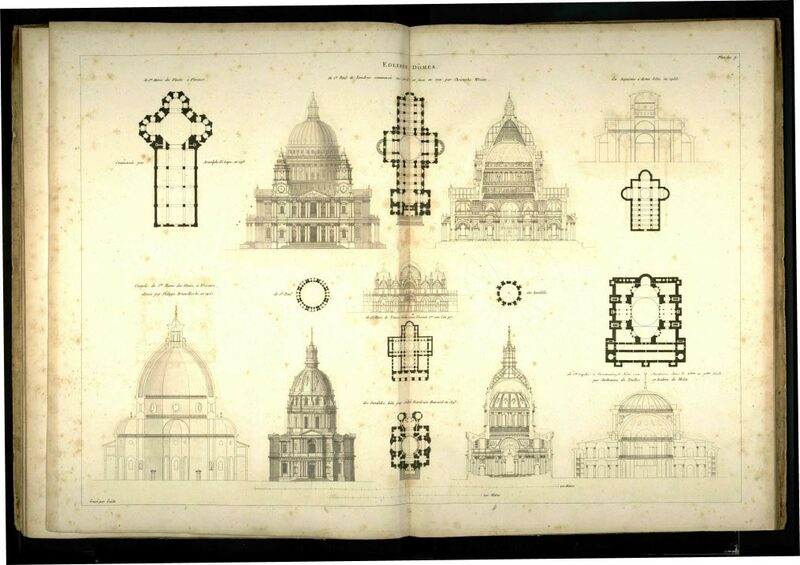 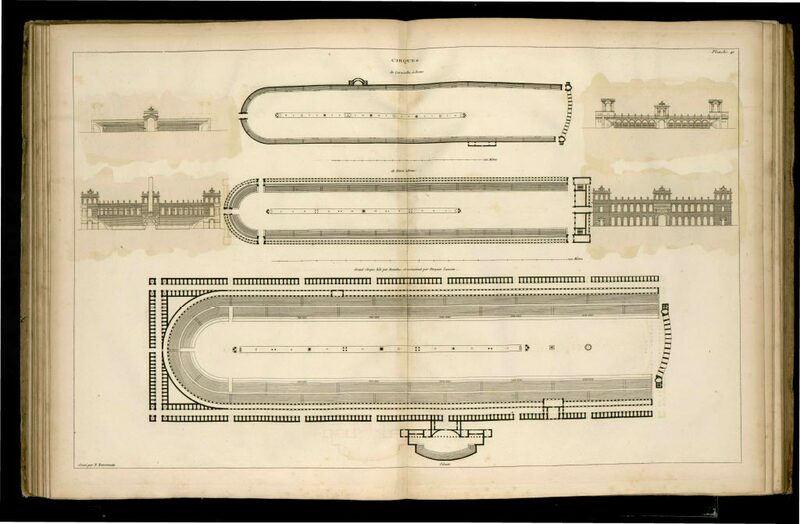 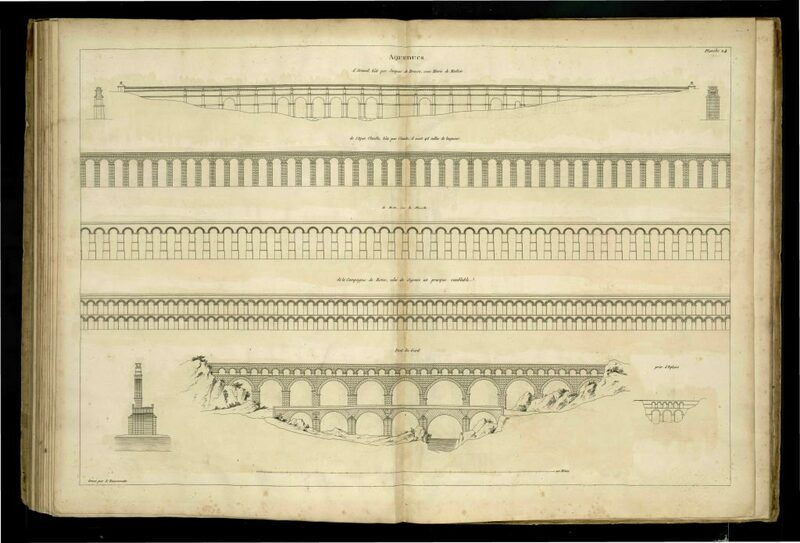 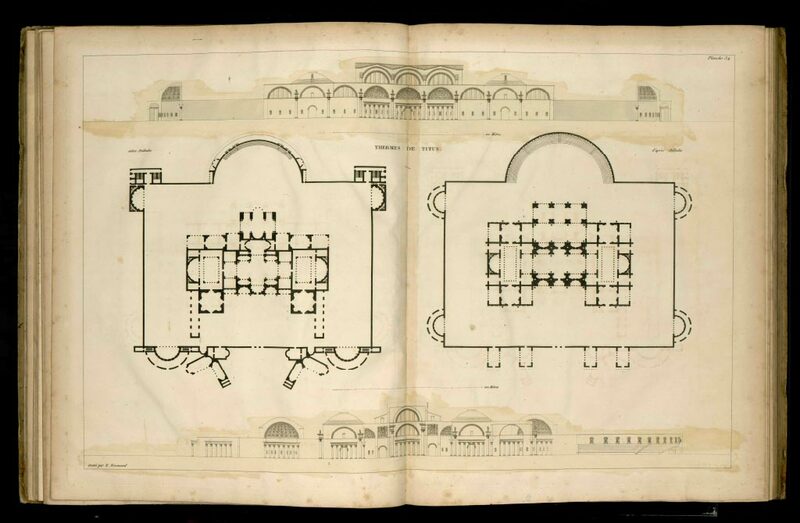 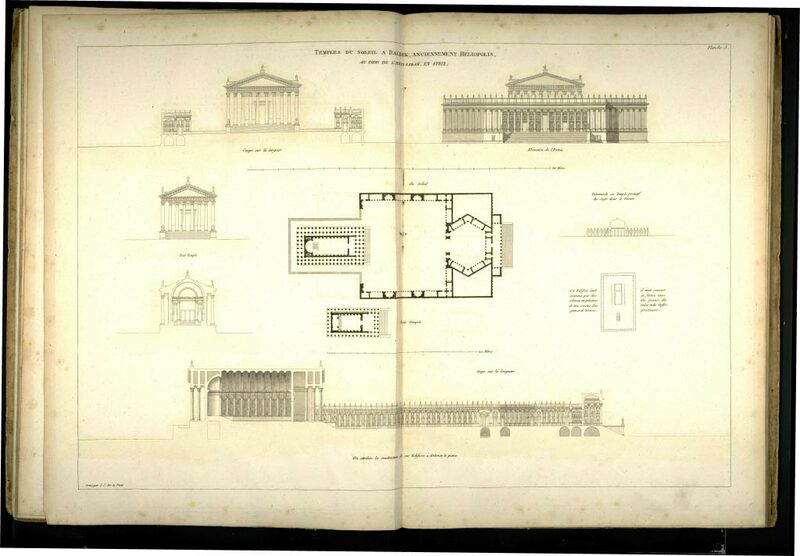 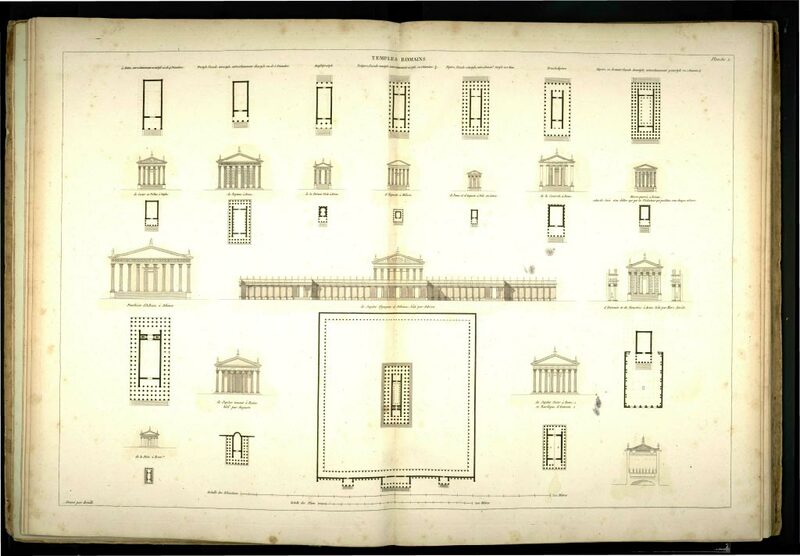 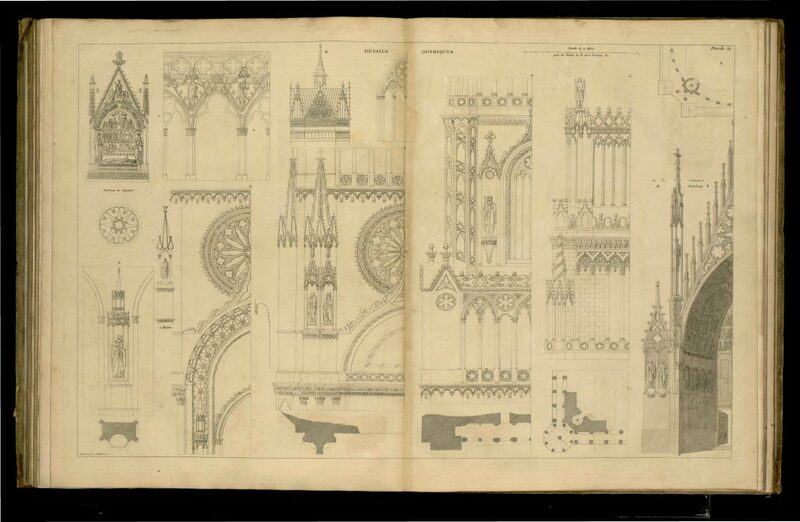 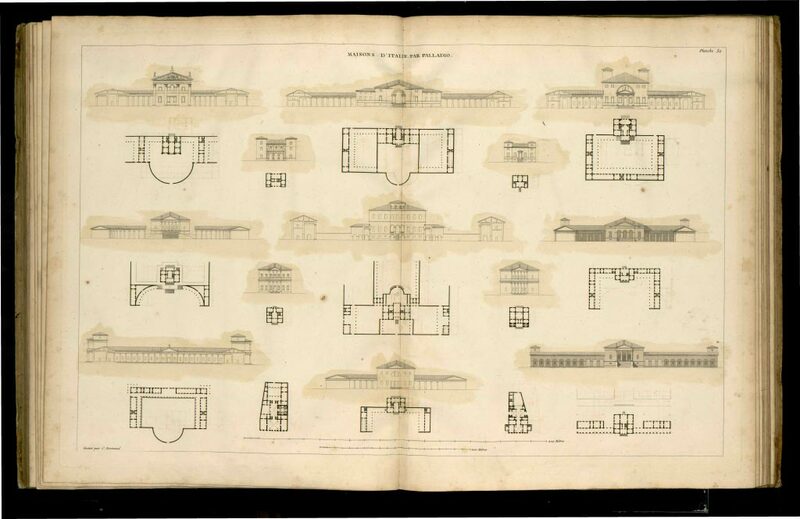 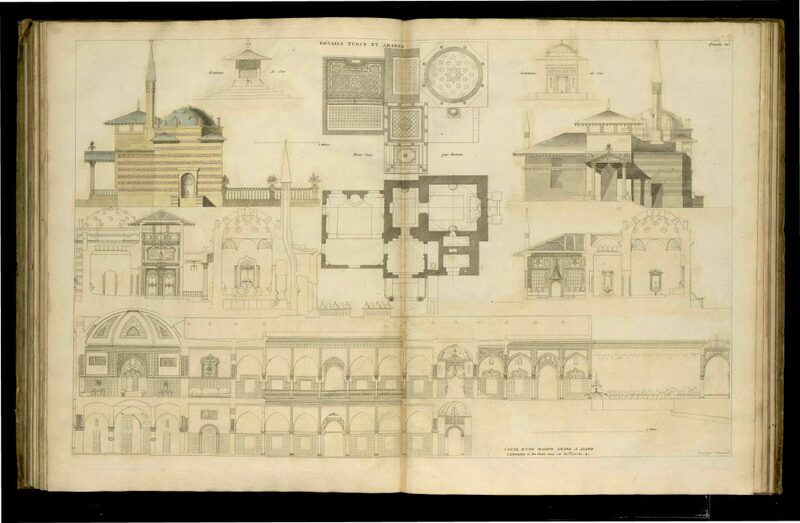 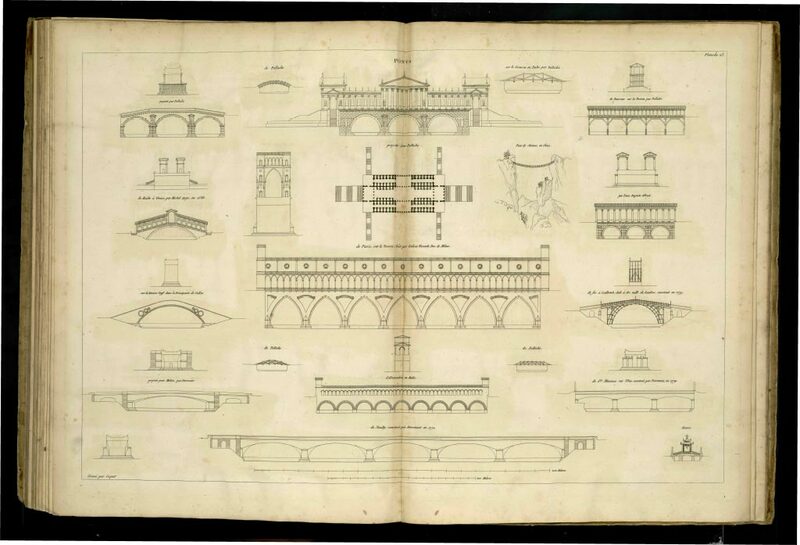 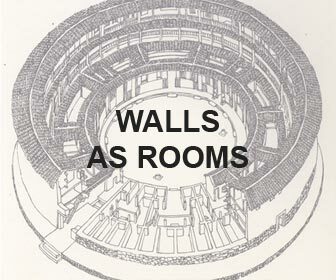 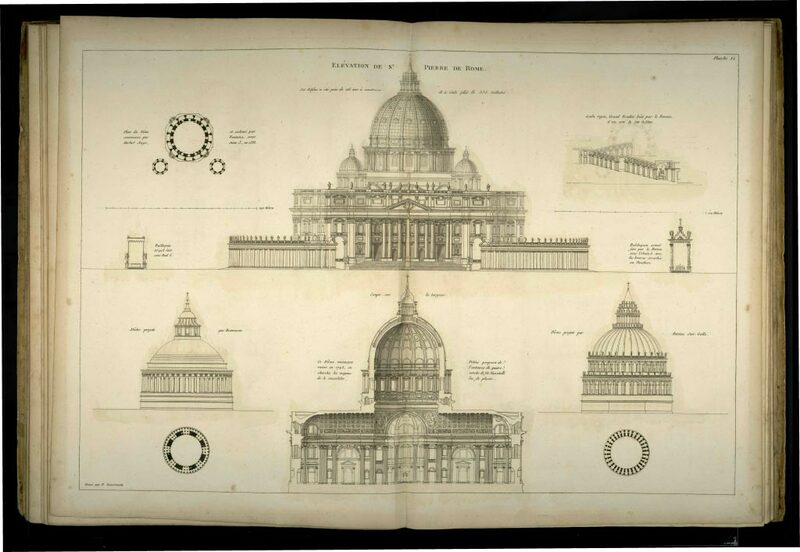 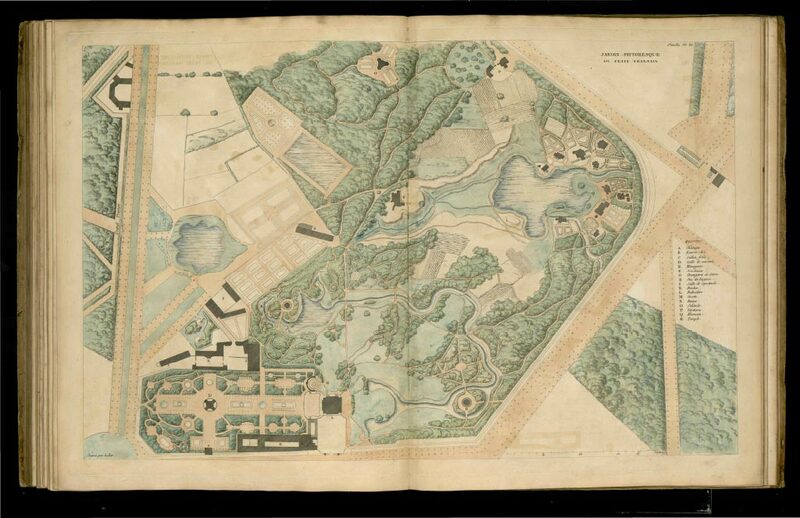 1176 individual drawings, (plans, sections and elevations) are contained in the book, representing over 40 types. 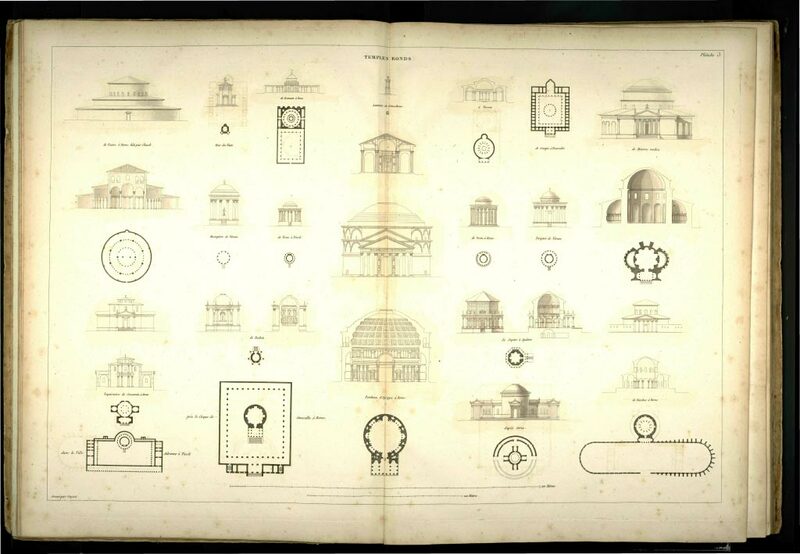 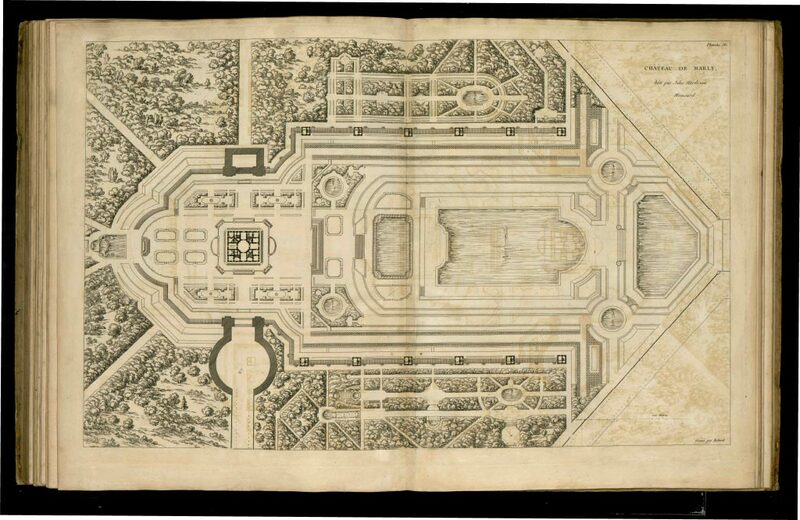 Less than 50 years after Piranesi’s original design for Campo Marzio, Durand included, at the “Planche 16” of the Récueil (image below), a selection of buildings from that imaginary universe. 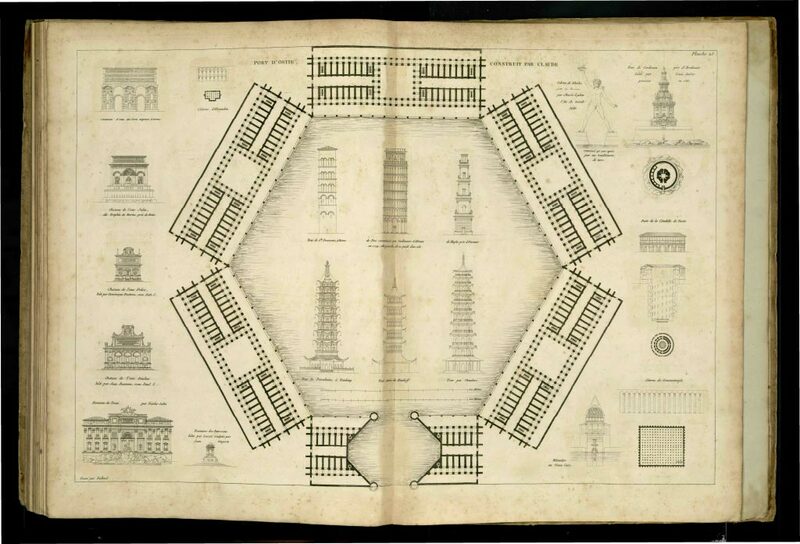 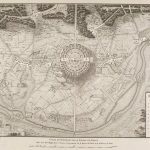 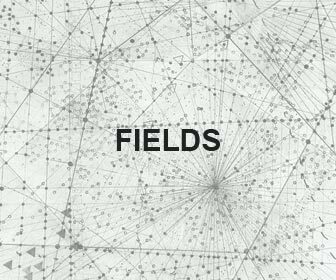 In the plate “Divers Édifices publics, d’après le Champ de Mars de Piranese“, the density and fragmentation of the original Campo Marzio disappeared, in favor of isolated buildings and components, lined up in rows, exhibited and disentangled in a pure Cartesian universe of right angles. 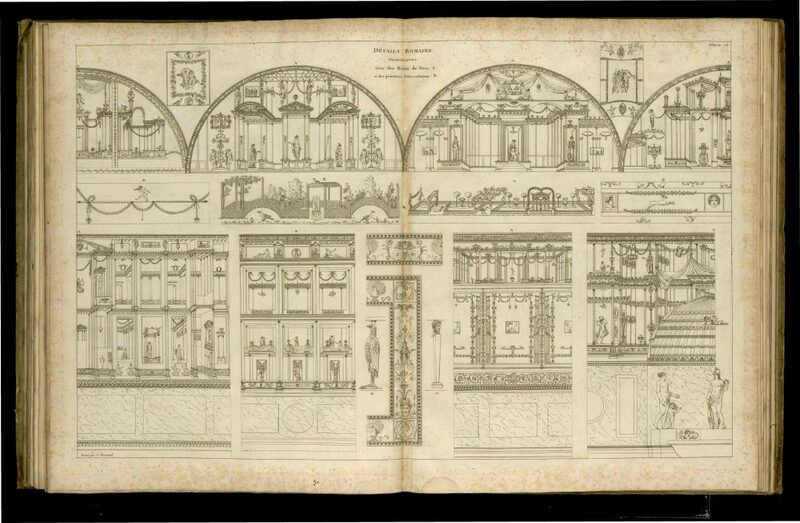 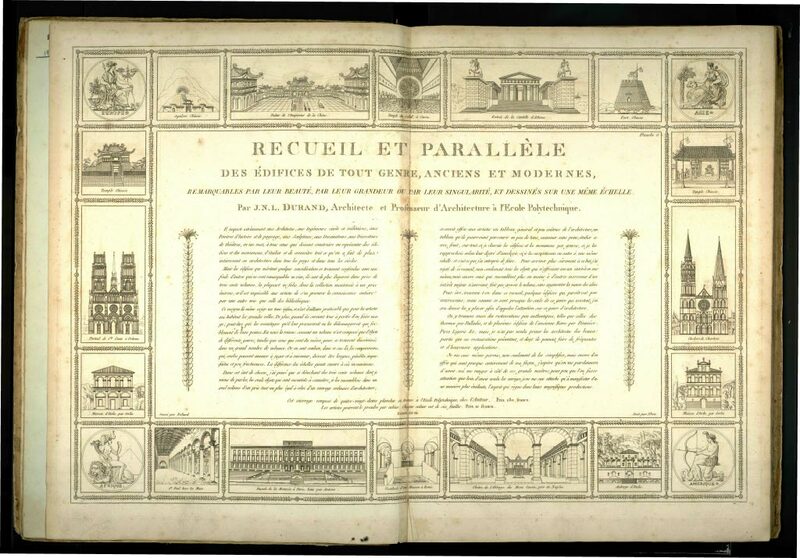 The Récueil will be complementarily accompanied by the successive “Précis des leçons d’architecture données à l’Ecole Polytechnique“, a double book (also known as “Le petit Durand”) published in 1802-05 and destined to become an aid for his teaching at the Ecole Politechnique. 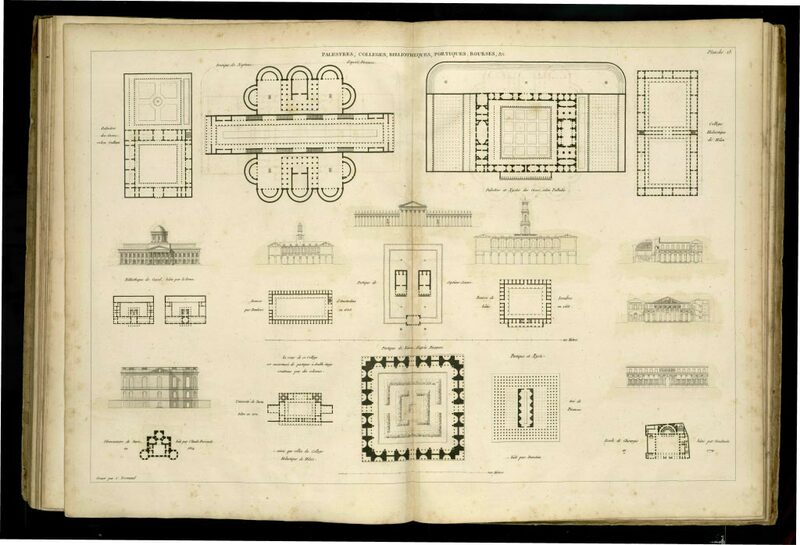 This work revealed the basic concern Durand had for structural rationalism, construction and economy, by illustrating ingenious ways of combining architectural elements in structural modular systems. 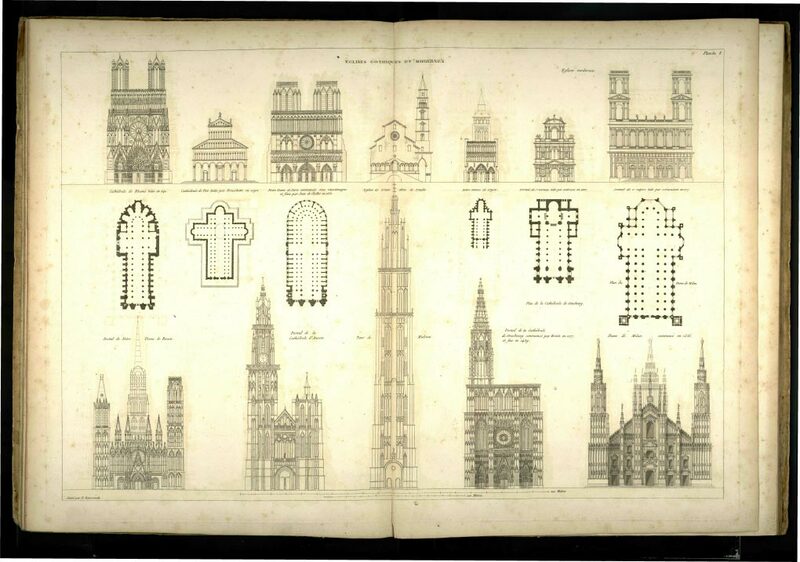 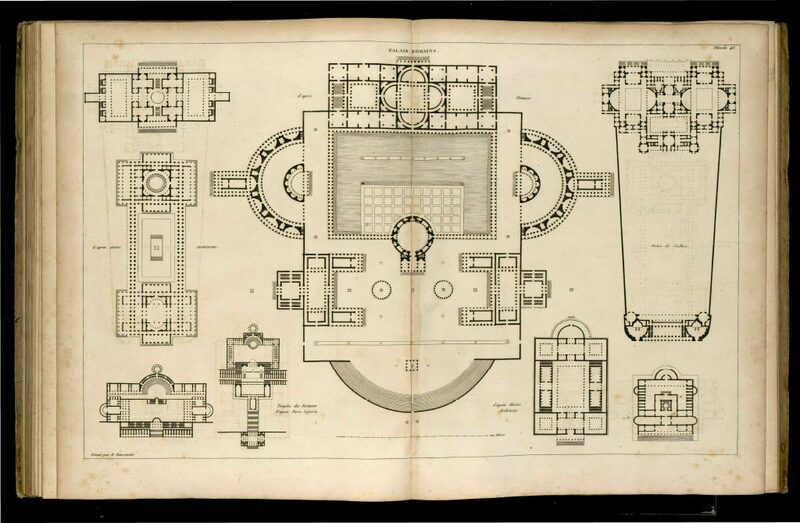 As a survey of every relevant building built since classical times up to the late eighteenth century, the Récueil is as much a product of the classification studies based on function that Cuvier had done in the field of zoology, as the result of the author’s interest in the philosophy of history and in the lessons learned from the archaeological discoveries of the middle of the eighteenth century. 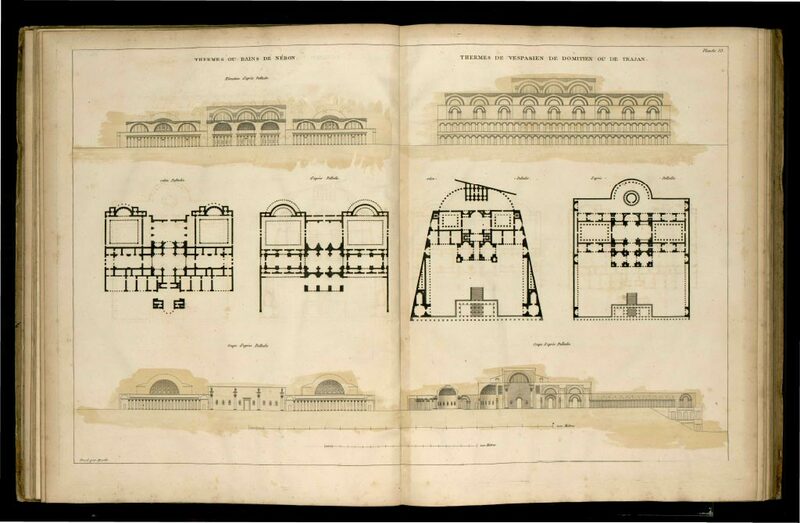 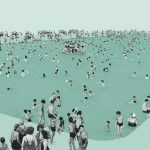 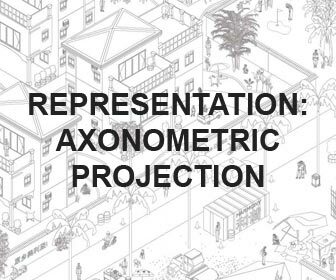 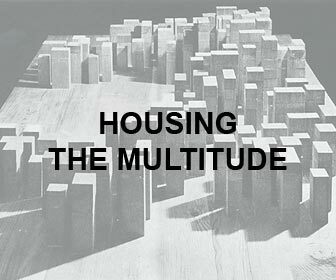 The Récueil’s classification method relies on the isolation of the buildings from their historical and physical context, in order to encourage architects to analyse the architectural form without indulging in contingent cultural or urban conditions. 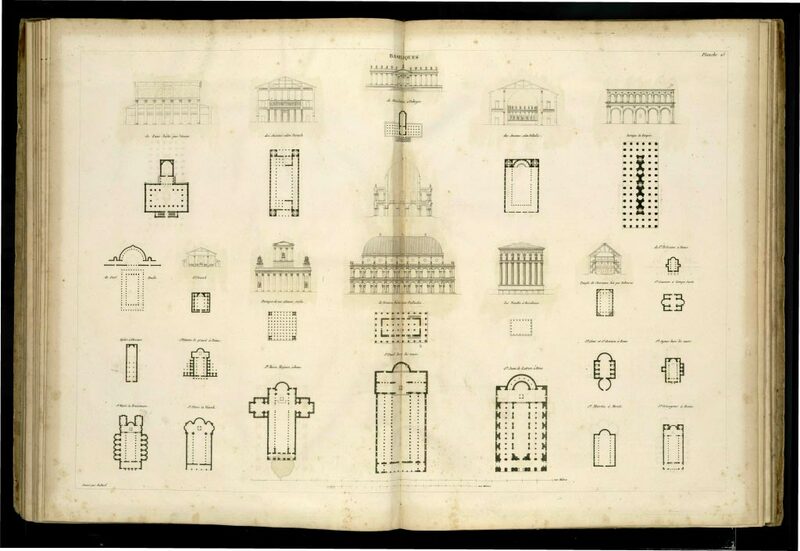 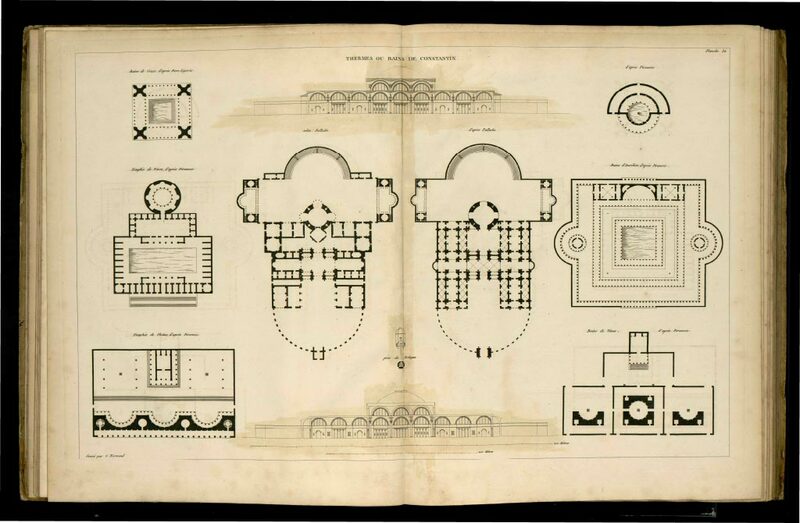 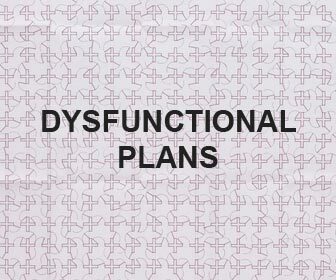 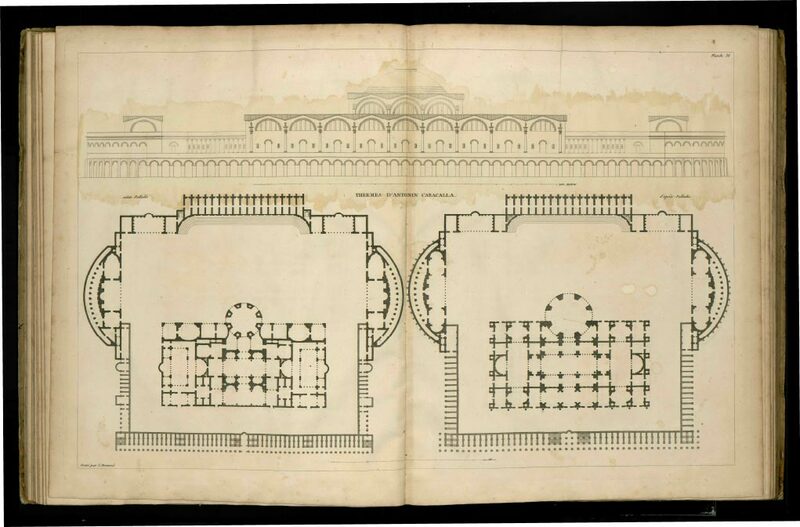 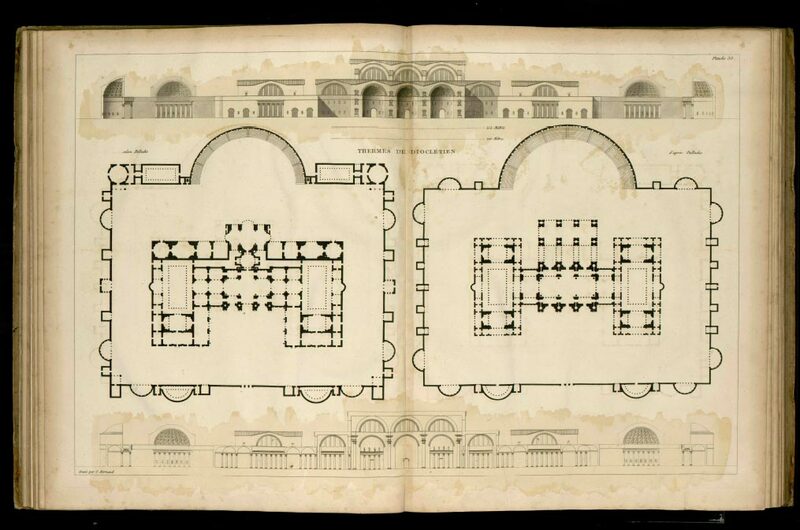 All style was acceptable after the recognition of the universality of beauty, yet Durand often altered the proportions or modified the drawings of the original buildings to conform to his own modular theory of proportion. 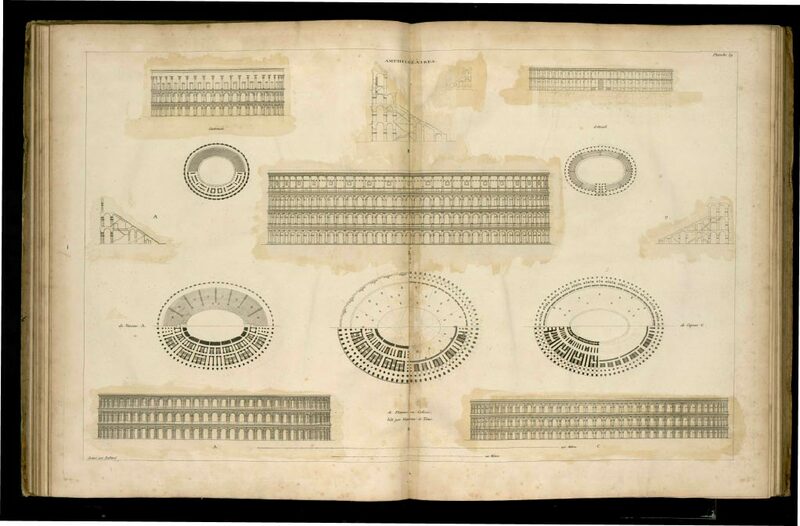 The following is a selection of plates. 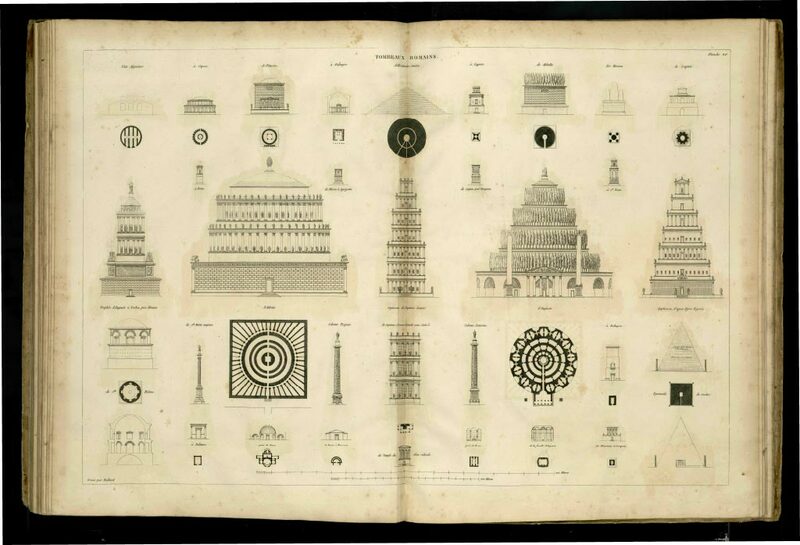 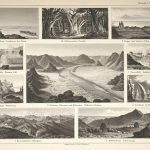 For a complete, hi-res version of the book (also downloadable as pdf), please follow the links to the “Bibliothèque Numerique patrimoniale“. 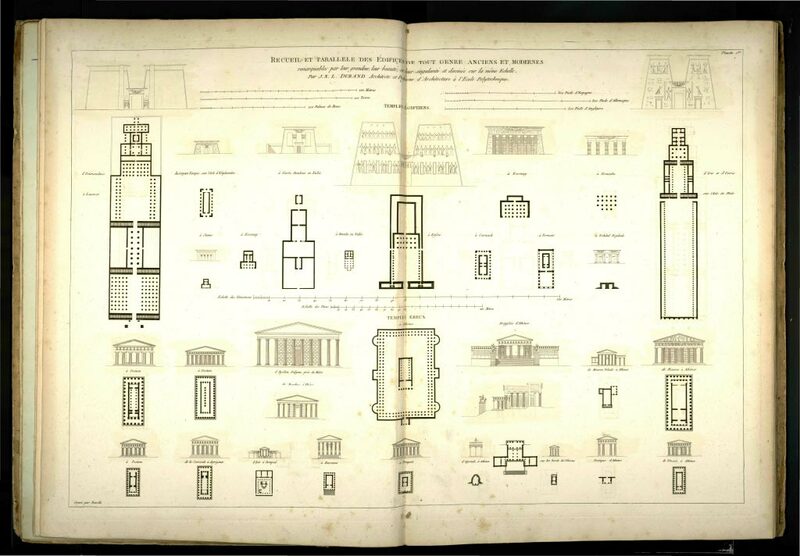 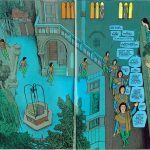 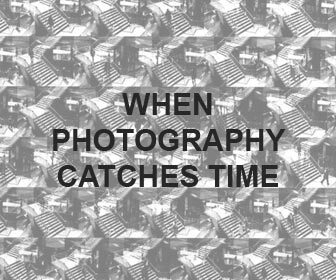 can you buy a reproduction of this book anywhere?